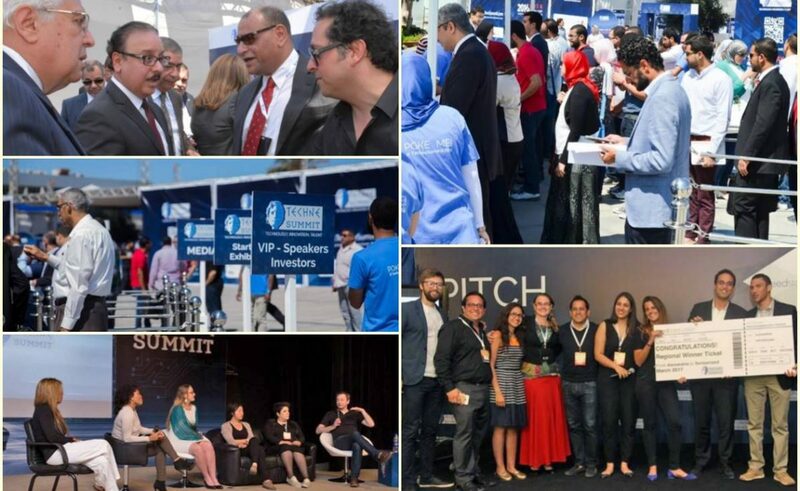 Techne Summit, the international entrepreneurship technology event took Egypt by storm on May 7th to 8th, 2016 and brought together 80 renowned global players in the technology industry from 20 different countries, including Cisco, Intel, Google and World Economic Forum Young Global Leaders, along with100 startups and 1,600 attendees on the Mediterranean city of Alexandria. This May, Techne Market comes to Dubrovnik, but before that, read the experiences from Egypt! Carrying the same slogan of TECHNOLOGY – INNOVATION – TALENT on which the event concept is built, the two-day summit acted as a platform for these international global players to share experiences, wisdoms, observations, predictions and opportunities. Techne Summit 2016 was held under the auspicious of The Ministry of Communication and Information Technology where Minister H.E. Eng. Yasser El Kady led the event’s opening ceremony along with current Alexandria Governor Mr. Mohamed Abdel-Zaher. Impressive media coverage included APO, Cairo Scene, Egypt Innovate, Wamda, The Next Silicon Valley, Tech in Asia, Entrepreneur Middle East, Tech bel 3arabi, Mega FM, Arab Net, Wattan TV, Youm7, Al Hayat TV, and Misr News. Techne Summit 2016 was built on the success of the first Techne Summit held back in October 2015 where it was the first of its kind event in the region. This year the event continued with the same philosophy of capitalizing on the crucial role of technology and communication in the development of individuals, businesses and nations by fostering innovation, creativity and entrepreneurship to serve the development process. “Techne Summit vision started by the former governor of Alexandria, Mr. Hany El Messery and his marketing department led by May El Nahrawy. We are continuing on this vision and mission to put Alexandria back on the touristic map. We’ve built on that to support and ensure youth empowerment and building bridges between entrepreneurial ecosystems” said Tarek El Kady, Managing Director, Markade & Techne Summit Founder. Techne Summit presented a wide range of international speakers with the opportunity to share their experience with professionals, enthusiasts in the industry, as well as network with others in the technology field from around the world. The Summit also presented a rare opportunity for startups in the Middle East & North Africa region to connect with investors, showcase their products, acquire funding for their businesses, exchange ideas and experiences and gain the recognition they deserve across various media channels. Similarly participants had access to the latest innovations and business trends through not only the speakers but workshops and competitions which were the highlight of the event and allowed much of the innovative ideas to be put to use, gaining exposure and increased knowledge in the field. Similarly investors were able to explore new areas of potential business collaboration and potentially successful investments, paving the way to mutual business growth for all participating parties. The event was successful in ultimately developing the technology industry by fostering the mindset of decentralization within the field and building bridges of informational and cultural exchange between regions. An important goal of Techne Summit was to also expand the contribution of conference tourism to the city of Alexandria and in turn Egypt. “For the first time Techne Summit featured the field of Medical Technology,” said Reem Jabak – board member of Techne Summit. The highlight of this year’s event featured a wide array of elite and diverse competitions for startups that extended throughout the two day event and presented shining start-ups with opportunities to pitch and in turn fund their businesses. Among the highlighted competitions was the SeedStars Alexandria 2016 Competition, which aimed to support tech or tech-enabled startups with prizes of over $1,000,000 in value. The winning start-up was Tutorama who will join the global Seedstars Family and take part in the regional and global Seedstars Summits that include boot camps and investor forums, while earning one flight ticket to Switzerland to compete for further investment prizes. Swedish Institute Alexandria shortlisted eight startups and innovations from a long list comprising over 40 ideas. The competition was run by a panel of investors, innovators and entrepreneurs as well as the deputy director of the Swedish Institute Alexandria Mrs. Javeria Rizvi Kabani. The criteria of selection was how the presented startups or innovations had a positive impact on climate change and environmental protection or if it had a social impact that helps improve the livelihood of disadvantaged people. The winners of this competition were Jereed, Rayeh, Hope from Egypt and Education Media Company from Morocco. The winners will be visiting Sweden after the summer for a study exchange to learn about the Swedish landscape of innovation and entrepreneurship. Upscale Development also held a competition for tech or tech-enabled startups that were in line with education, IoT, smart cities or environment. The winners were: “Tutorama” 1st place 50,000 L.E, “Qoudra” 2nd place 30,000 L.E, Hommect 3rd place 20,000 L.E & Tyro 4th place 15,000 L.E. As every year, TIEC, led by Rasha Tantawy held the Alexandria Future Technopreneurs Competition, a competition for early stage startups where more than 6 startups won a TIEC Accelerator Voucher. Techne Pitch – powered by Abraaj Group, offered $3,000 for the first place winner, awarded to Tatweer. Uber Egypt teamed up with Techne Summit to provide an #Uber7antoor where young entrepreneurs pitched their big ideas to some of the country’s most established investors while sharing a pimped out 7antoor trotting along Alexandria’s iconic coastal road! #Uber7antoor took 12 promising startups to pitch their ideas by the seaside. #TechneSummit2016 hashtag was one of most trending on twitter on the summit’s second day. “Techne Summit 2016 wouldn’t have been possible without our sponsors, those who believed in the importance of a summit like this and in its positive repercussions in Alexandria and the region,” said Mohamed El Dallal – Techne Summit Co-Founder. Techne Summit was sponsored by The U.S Consulate in Alexandria, The Swedish Institute in Alexandria, Aramex Egypt, Upscale Development, Microsoft, Digital Dreams, Uber Egypt & El Kal3a Club. Community Partners included Global Shapers Alexandria, Nahdet El Mahrousa, IEE Egypt Section, Rise Up Egypt, Ice Alex, Ma3mal co-working space, Ahead of the Curve, INNO 10, Telecom Egypt and Whova. “Over the two days of Techne Summit I have been discovering aspects of the event that developed exponentially,” says Tarek El Kady “all due to the magic that happens when great minds, passionate about a certain topic, come together. One of the most things that brought great joy to my heart is the energetic entrepreneurial spirit that was characteristic to this event. I am so proud of the startups that showed up with eagerness to partake in this summit and grow their businesses,” El Kady concludes.